As the market is full of different guitar strings brands and each of them have different string tensions and options sometimes is difficult to choose the right set of strings for your guitar. We will try to clarify some concepts here and explain what the options are but at the end of the day experimenting and trying different strings will give you a clear idea of what you are looking for in terms of sound, volume, attack and playability. 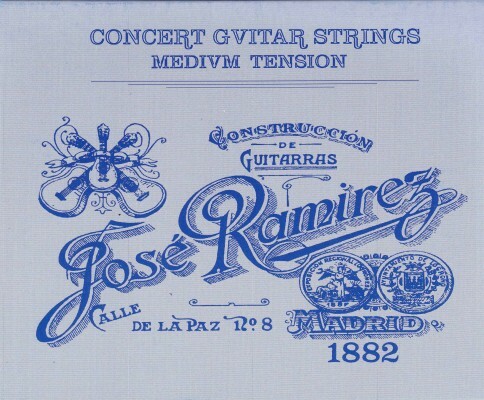 The first thing we would like to show you is how to restring your classical guitar or your flamenco guitar. Surfing the web we found this video by Phorenon that explain visually and in deep detail how to do it properly. The only extra advice that we could add to this illustrative video is that when you change the strings, try to do them one by one in order to maintain the tension on the bridge and the neck. Which String Tension to choose? The string tension is the amount of tension pulling on each string when in tune. String tension ranges from low to extra high. Every guitar reacts differently to each string tension, so experiment until you find one that sounds best on your guitar. In general, the higher the string tension, the louder your can play without getting a buzzing sound. However, you must use more effort to play a high tension string loudly. Since low tension strings have less pressure, you can easily push them down against the fretboard with the left hand fingers. 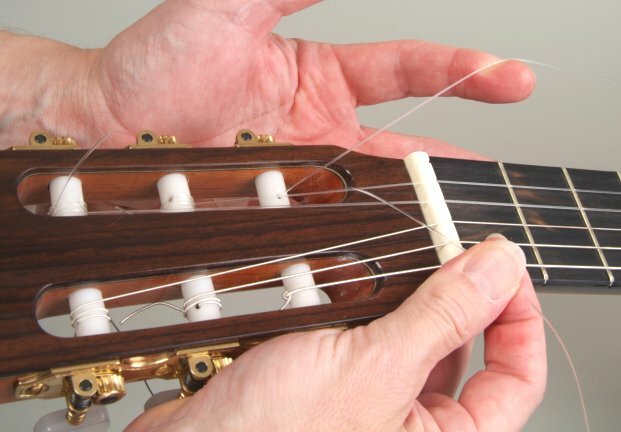 As a result, all classical guitar techniques are much easier to play on low tension strings. Moreover, this helps you to conserve energy for longer practice sessions, and prevent bad habits, like squeezing with the left hand. The “attack” is the strong sound that you hear instantly after you pluck a string. High tension strings have a strong attack, making them sound more accented. This is very good for rhythmic playing, but bad for smooth legato playing. The “body” is all of the sound in the middle of the note, after the initial attack. Lower tension strings tend to have less attack, but more body. This is good for smooth, legato playing, but bad for rhythmic playing. Each string material produces a different tone when you play. Some materials are mellow while some are bright. Some are clear while some are dull. For the most part, you only need to worry about string material for the top 3 strings. Also, don’t be afraid to combine different string materials. For instance, many people use nylon on the 1st and 2nd string, and carbon on the 3rd string. Nylon strings are the most common type of string material. Nylon strings generally sound very clean, warm and mellow, but can be very dull and lifeless when playing on the third string, or in higher positions. Carbon strings are a very recent development in the classical guitar world. They are very bright and clear, and good and projecting across a room. Carbon strings sound very good when played in the middle registers, but are sometimes weak in the high registers. Gut strings are the oldest type of guitar string. They have a very rich mellow sound, but are also very quiet. Do not use gut strings if you play with fingernails – your nails will tear the strings apart. Nylgut strings are another new development in the classical guitar world. Nylgut strings are made of nylon, but are designed to sound like gut strings. They have the warm rich sound of gut strings, and your nails will not tear them apart (like normal gut strings). You should change your strings whenever they start to sound dull and quiet. How long will this take? It depends on the person. Based on how much you play and how oily your skin is, your strings may last anywhere from 2 weeks to 6 months. Also, treble strings tend to last a lot longer than bass strings. Clean your strings with a dry cloth after playing and you will keep your strings in good shape for longer periods and the sound will be brighter and sharper. Posted in Acoustic Guitars, classical guitar music, Classical guitars, electro classical guitars, electroacoustic guitars, flamenco electric guitars, Flamenco guitar music, Flamenco guitars, flamenco instruments, flamenco music, guitar, Guitar for beginners, guitar music, Guitar players, MIDI guitar, MIDI guitars, musical instruments and tagged Acoustic guitar, alhambra 4p, alhambra 5p, alhambra 6p, alhambra guitars, alhambra guitars uk, best classical guitar, best flamenco guitar, buy flamenco guitar, buy spanish guitar, classical guitar, classical guitar action, classical guitar strings, flamenco guitar, flamenco guitar action, flamenco guitar strings, how to restring a guitar, raimundo guitars, restring a classical guitar, sellers for Alhambra, spanish guitar, Spanish guitar making. Bookmark the permalink. hey Manuel, thx for the info and the vid, it is very informative and helpful! Nice Blog But I always been confused about when should I change my guitar string, So I fixed the particular time period for change my guitar strings.